VidPro Corp. made Lithium-ion battery , 900 mAh, with much more extended capacity to run your camera. 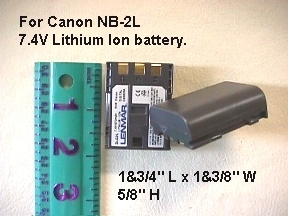 It is still at the same dimensions - 1&3/4" L x 1 &3/8" W x 5/8" H.
VidPro Corp. made Lithium-ion battery ,7.4 V , 900 mAh, with extended capacity to run your camera. It is at the same dimensions - 1&3/4" L x 1 &3/8" W x 5/8" H.